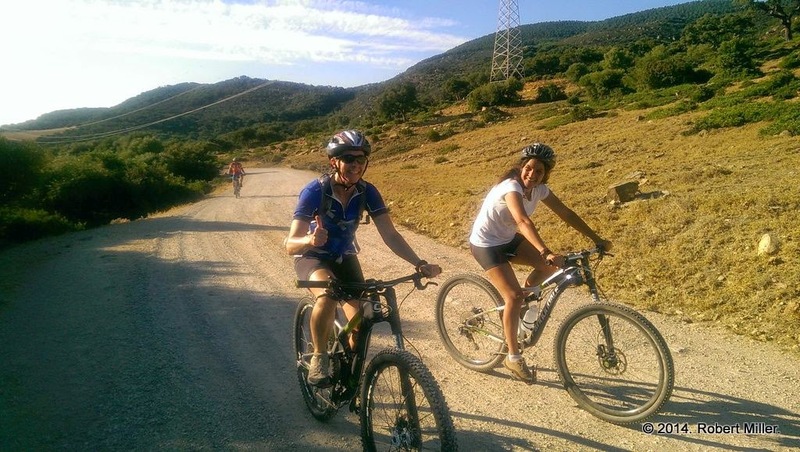 Friday 15 August 2014 - Rob had the day off at Migres and we hired a Taxi ride to Gibraltar- a British territory. We ate an English breakfast then hiked around and up to the castle which is full of history having been taken over by many different people and re-built throughout time. Rob with a full English Breakfast (except for the coffee), Gibraltar. We found the tram car and paid for a 6 min scenic ride up to the top of the Rock of Gibraltar. The Rock at its peak is 1,398 ft. and made up of Jurassic Limestone. A Big Rock! It takes up most of the peninsula. As the tram car docks in at the top, a troop of monkeys (Barbary Macaques - native to the rock) are waiting to accost travelers of their belongings. They are mostly looking for food, but quickly snatched a shopping bag of someone in our tram car party. Barbary Macaques accosting visitors, top of Gibraltar. Barbary Macaques blocking the path off of the tram, top of Gibraltar. Barbary Macaque on railing at visitor center, top of Gibraltar. It was a foggy, humid morning so visibility was pretty poor, but at the top is quite a view of the Mediterranean Sea and Spanish coast. The Rock has a knife edge ridge at the top and the Levante winds were blowing from the east. This created an interesting phenomenon where one side of the ridge (the one we were standing on) was sunny and the east side completely fogged with a few feet at best visibility. If you stepped to the top of the knife edge, you could feel and see the cool fog blowing hard up the rock and into the air. It felt like stepping into a freezer with a big fan blowing – an awesome contrast to the humid heat! Hard to describe but the effect looked man- made (like a snow blower –blowing fog). The cool blowing air felt great but was hard to tolerate since it was a strong wind. Levante Fog blowing over top of Gibraltar. We hiked around the top of the rock viewing many defense towers and bunkers that were built to defend the rock and taking in the vast panoramic views. View of the main urban area of Gibraltar from half way up the rock. View out into the Mediterranean Sea from top of Gibraltar. The monkeys seemed to be everywhere at the top of the Nature Reserve. Further down, we toured the Great Siege Tunnel – tunneling started around 1779 and this tunnel was completed as it is today around WWII. It is a long tunnel, full of history, old cannons, artifacts and holes you could peek out of! There are also many tunneled roads in the lower part of the rock which are used today by the Gibraltar Military and are off limits to civilians (30 miles or so). Inside the Great Siege Tunnel, built to defend the north side of Gibraltar. View toward Spain from inside the Great Siege Tunnels. There are also many natural caves in the Rock. We toured St. Michael’s Cave - a dramatic, natural grotto with stalagmites and stalactites which was incredible and much larger and expansive than I expected. The cave is used as a natural amphitheater for music concerts. Inside St. Michael’s Cave, with dramatic lighting and music, Gibraltar. 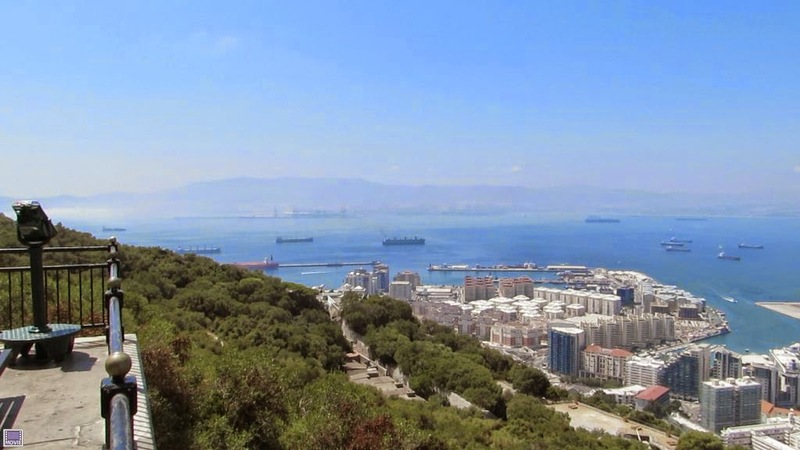 Every inch of this peninsula is used and land is being ‘reclaimed’ from the sea as Gibraltar is one of the most densely populated territories in the world. Water is collected off the rock, and water is desalinated from the ocean for drinking and use. There is an airstrip that runs perpendicular to the main street entering Gibraltar from Spain. If you enter by foot as we did, you walk across the tarmac. When planes are scheduled to land or take off the strip is closed temporarily to auto and foot traffic! Gibraltar Airport from the top of Gibraltar. Having explored most of the attractions at the top of the rock Nature Reserve – where most of the history and tourist attractions are, we worked our way down to the heart of the city through a series of steps. Narrow paths in the city, Gibraltar. There are many stairs to climb up and down that wind around the city, in and out of residential and public areas. Hungry, thirsty and tired, we searched to no avail for an Indian Food Restaurant. 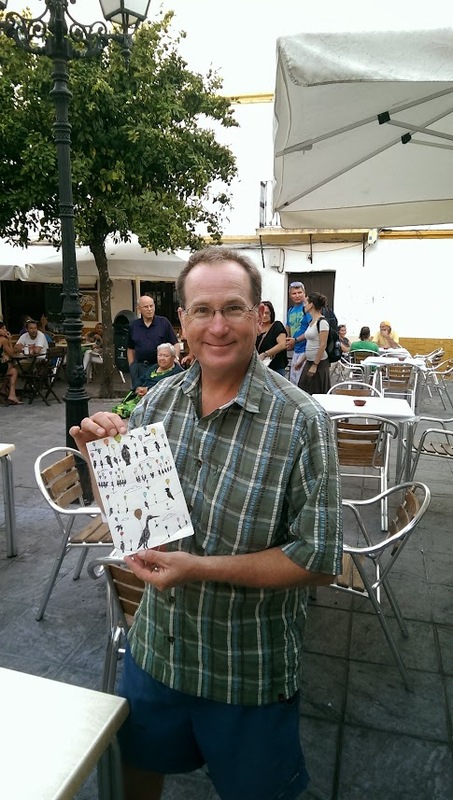 We found ourselves on the main street at a local bistro named “Llanito” – a great find! We were taken in by the site and smell of the varied (culturally mixed) dishes being served. We ordered and consumed large salads and a quatro formaggi pizza. I later learned thru Wikipedia: “Llanito” is a name many locals of Gibraltar call themselves celebrating the mixture of cultures which represent the people of Gibraltar. We left by taxi having enjoyed a really fun day in Gibraltar – Cheers! 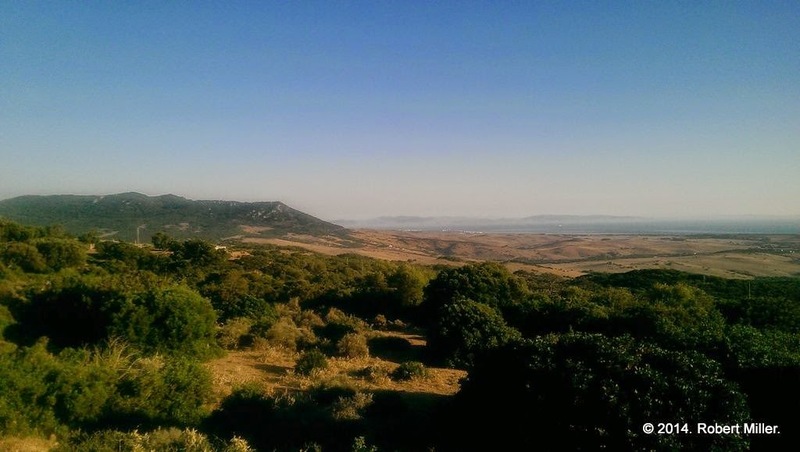 For more background on our two months of studying birds at the Strait of Gibraltar in partnership with the Fundación Migres and Boise State University’s Intermountain Bird Observatory, refer to my last six posts.